***** One of my favourite companies I discovered for the first time last year were Denys Edwards Players, so when I was invited to review their first production of 2019, and the second supernatural tale set in a theatre of the year so far, I had to say yes. 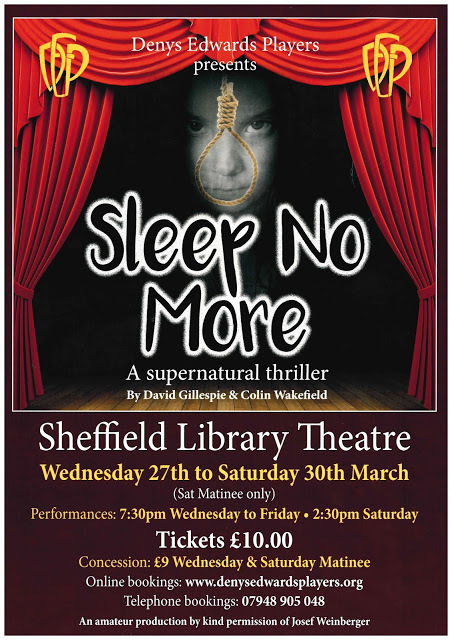 Written by Colin Wakefield and David Gillespie, Sleep No More is a new supernatural thriller set in a theatre that has been closed for 60 years following the accidental death of a child during rehearsals of a play “Murder by Poison”, a Victorian thriller. Now Micky, the great-grandson of the theatre’s original owner, has set about restoring the theatre and to cap his plans he’s intent on reviving the very same play to re-open the renovated theatre. Only Micky’s father knows the truth of what happened years ago and tries to warn Micky that the play is doomed. Micky ignores the warnings and as rehearsals progress unusual and mysterious happenings begin with deadly and terrifying consequences. Sleep No More is the company’s latest professional standard production that shows they are only getting better and better with a production that not only provides an insight into the behind the scenes of and rehearsals at a small theatre and a harrowing ghost story. With Ashleigh Andrew as Eve’s harrowing singing, looks (I will never look at Dorothy from the Wizard of Oz’s plaits and blue gingham dress in the same way again) and final scene of the first act destined to haunt audience members dreams. Whilst Andrew Hibbert as Mickey perfectly captured the luvvie director, Sophie Perez-Smith as Sal the youth, inexperience and naivety of the trainee stage manager and inexperienced actress, and Angela Blackwell and Paul North as Jenny and Pete (no connection to Cold Feet) capturing the established actors, their complex relationship and their characters rehearsed in the play within the play; the truly outstanding performances of the night for me came from the young Ben Rossiter as Ben, who was a complete natural on stage with fantastic acting talent, confidence and stage presence for someone so young and a natural emotional connection with the rest of their characters which combined is the perfect acting package and proves he is guaranteed to go far; and John Castell as William, with John’s 50 years of treading the boards shining through as Mickey’s damaged and haunted father. The clever direction of Sue Cox added intensely to the production, getting the very best out of the cast and making fantastic use of both the stage and auditorium area to bring the theatre within a theatre to life. Behind the scenes I must also mention Brad Shaw and John Clapham, who more than succeeded in the quadruple lighting challenge of lighting the play, the play within the play and the theatre within the theatre whilst capturing the atmosphere of the ghost story; and which ever member of the production team was in charge of the rope, which confirmed the eternally powerful and haunting image of a lone noose. Sleep No More is a must see for fans of the ghost story genre and anyone who has ever wondered what goes on off stage, with the busy opening night audience confirming this, and like all good ghost stories it came with a shocking ending and some unexpected shocking twists in the tale, which as a new production I think even the biggest fan of the genre will struggle to predict. 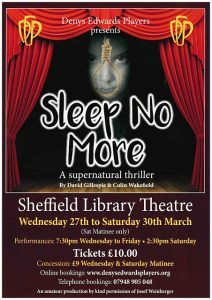 Sleep No More will be performed at the Sheffield Library Theatre at 7.30pm on Thursday 28 and Friday 29 March and at 2.30pm on Saturday 30 March. Tickets are £10 and (for the Saturday only performance) £9 for concessions. For information on how to book visit www.denysedwardsplayers.org/current-production-2. Denys Edwards Players next production is The Vicar of Dibley from at 7.30pm from Wednesday 14 to Friday 16 August and at 2.30pm on Saturday 17 August at Sheffield Library Theatre. For further information visit denysedwardsplayers.org.